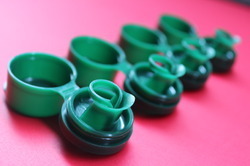 FLIP TOP CAPS FOR OIL BOTTLE CAPPING AND COSMETIC APPLICATIONS. The mould developed with 4 multi cavity with side cores. the cap having internal undercuts, external undercuts, peal-off ring , seal etc... this is for fully cealing for oil bottle applications. The flip top caps are manufactured using injection molding machines with utmost precision to ensure correct fitment and zero leakage. These caps ensure the dispensing of small amount of liquid as per convenience. As this is a critical component, it needs to be manufactured under stringent quality check. 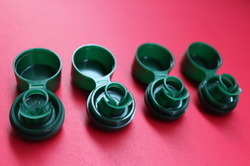 Available in a wide variety of sizes, colors, shapes, thickness and patterns, we offer a qualitative range of Plastic Caps, which is provided with Flip Tops.